Centerpieces provide a visual focal point for a table and give people sitting there something to talk about -- which comes in especially handy for situations in which not everyone will know one another. Whether you are designing centerpieces for a small Bible study group or a reception following a Christian wedding, or you simply want to spruce up your dining room table with something that reflects your faith, weave Christian elements into your designs to make centerpieces beautiful and meaningful. 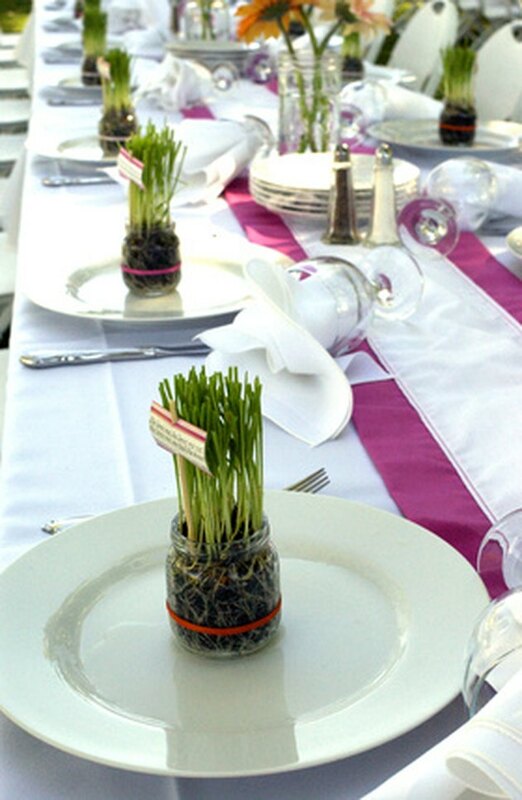 Secular centerpieces can be "Christianized" with simple tweaks. Purchase rocks engraved with words and phrases important in your Christian faith, such as "believe," "faith," "worship," "Jesus," "Father," "cross," "sacrifice," "Heaven," "prayer" and "forgiveness." Take a simple clear glass vase or pitcher and fill it with polished river rocks and the engraved rocks, alternating between the two to create a pleasing visual contrast. Invite people who sit at the table to select an engraved rock from the vase as a reminder of the meal or occasion and of the centrality of your faith to everyday life. If you have artistic inclinations, paint a Christian symbol or motif into the vase. Possible images include a cross, a lion and a lamb, a stylized crown of thorns, an angel or the Virgin Mary. Start with a small wooden fruit crate from the grocery store, the kind in which mandarin oranges often come packed. Arrange glass jars in neat rows inside the crate. Each jar should be filled with rich soil and have sprouts just beginning to emerge from the surface. Attach decorative metal or wooden letters along the front of the jars, spelling out a phrase or a fragment of a Bible verse, such as "Far above rubies" (Proverbs 31:10), "Honor thy father" (one of the Ten Commandments), or "The Lord is my shepherd" (Psalm 23). Craft a rustic wooden cross by lashing together two sticks -- twigs and branches removed -- with leather cord, securing the bonds with strong glue. Grapevines or bundled twigs could be used instead of sticks. Set the cross in a clear single-stem flower vase and place the vase in the center of the table. This centerpiece style is particularly suited to people who prefer rustic, minimalist decor and strong statements about their beliefs. Alternately, embellish and soften the look by placing the cross in the center of an arrangement of bright, cheerful flowers.